2015 starts well for ETF affiliate FNV Transport and Logistics, and for the Hungarian drivers working for the Dutch haulier Van den Bosch Transporten. A Dutch court ruled on 8 January that the Hungarian drivers working for the company must be covered by the Dutch pay and working conditions as stipulated in the sectoral collective labour agreement. The company has been using its Hungarian branch as a subcontractor. Hungarian drivers were flown into the Netherlands to drive Hungarian vehicles, commissioned by the Dutch parent company, in and from the Netherlands. FNV Transport and Logistics had engaged in some months-long investigation into the operational management of Van den Bosch. The union interviewed witnesses under oath and invited inspection services to investigate the case. FNV and 10 of the approximately 80 Hungarian drivers used by Van den Bosch Transporten referred the case to court. 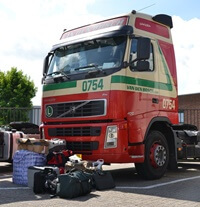 Edwin Atema of FNV Transport and Logistics said: “As far as we know, this is one of the rare occasions a judge in Europe has ruled on the interpretation of the EU Posted Workers Directive in road transport. In the short-term, we will certainly use this ruling to force other companies to comply with the collective agreement. This ruling helps bona fide Dutch and foreign drivers and employers in their fight for a fair and healthy transport sector“. The ETF welcomes the court ruling. The Posting of Workers Directive (Directive 96/71/EC) applies to road transport but its enforcement is hugely overlooked by European and national authorities. Hence, the massive-scale social dumping and social fraud practiced by some companies. The ETF and its affiliates will continue to put pressure on the European Institutions and Member States for an adequate enforcement of EU social and labour rules applicable to road transport, including Posting of Workers. FNV Transport and Logistics will continue their legal battle. It is currently working on a shortlist of companies that will be facing legal actions for using practices similar to the ones of Van den Bosch Transporten.